Glenn Beck University? Yes. Glenn Beck University. Conservative Fox News television host, author, and radio host Glenn Beck has started a university. 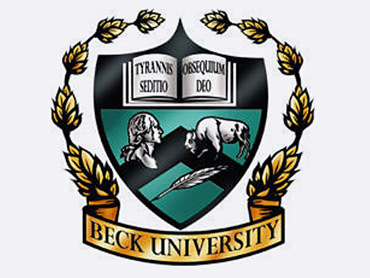 According to an announcement on Beck's Web site, "Beck University is a unique academic experience bringing together experts in the fields of religion, American history and economics." In July, August and September, interested parties can participate in "captivating lectures and interactive online discussions" in which "experts will explore the concepts of Faith, Hope and Charity and show you how they influence America's past, her present and most importantly her future." At left is the actual insignia of Beck University. (Note the buffalo, feather and Latin words.) To be clear, calling it a university is more than a stretch: It is actually simply an opportunity to watch online classes taught by three men, among them the controversial David Barton. Barton is described on Beck's site as "the founder and president of WallBuilders, a national pro-family organization that presents America's forgotten history and heroes, with an emphasis on our moral, religious, and constitutional heritage." He is an evangelical minister and GOP political activist who has pushed hard against the separation of church and state and been embraced by conservative Republican politicians. He has been criticized repeatedly for bad scholarship. According to People for the American Way, then-Republican Sen. Arlen Specter wrote in the Harvard Journal of Law & Public Policy in 1995 that Barton's arguments "range from the technical to the absurd" and "proceed from flawed and highly selective readings of both text and history." The other two teachers have more traditional backgrounds: Louisiana State University professor James R. Stoner, Jr. and former Columbia Adjunct Associate Professor of Psychology and Education David L. Buckner. Available classes are "Faith," "Hope" and "Charity" 101, 102 and 103. So how do you enroll at Beck University? By joining his "Insider Extreme" website at a cost of $9.95 per month or $74.95 for the year. A promotional page for the "Insider Extreme" subscription lays out what it offers beyond the normal "Insider" membership and features a variety of pictures of Beck mugging for the camera.